See and feel the near casino quality of our custom ceramic pokers before you buy with a $1 chip sample mailed FREE OF CHARGE. 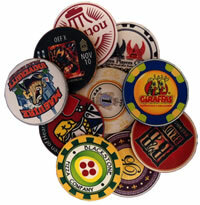 See and feel the near casino quality of our custom ceramic poker chips before you buy with a sample stack of ten chips. This will give you just enough to get the feeling of rifling thru a stack of custom ceramic chips. 2 Archetype poker chip sample pack. For about the price of a beer in your local pub, now you can see and feel the modern and secure future of poker chips before you buy. 2-chip Venerati ceramic poker chip sample. 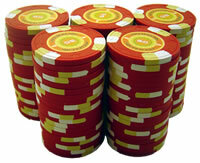 See and feel the quality of our Venerati ceramic poker chip line before you buy. 10-chip Venerati ceramic poker chip sample. 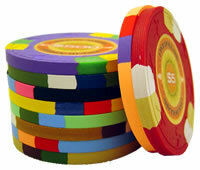 See and feel the quality of our Venerati ceramic poker chip line before you buy with a sample stack of ten casino chips. 10 Archetype poker chip sample. See and feel the casino quality of our popular Archetype casino chip line before you buy with a sample stack of ten casino chips. 1.5 hours of back and forth design services from our world class illustrator. This required step gets your ceramic poker chip design into the best possible print ready format to ensure the best possible chip outcome. low-cost prototyping. See the high-resolution graphics, full-color spectrum design capabilities, and 100% customization on the face and rolling edge of the chip.